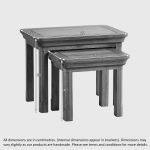 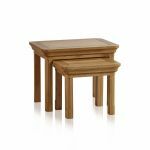 There's no question as to why nests of tables are such popular items of living room furniture; they offer high style and great versatility. 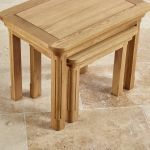 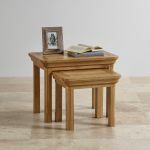 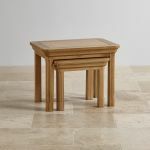 Our Canterbury set is made from high quality solid oak in our beautiful natural oak finish, so that you can rest easy knowing you're bringing only the best and longest lasting hardwood furniture into your home. 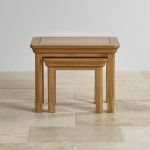 Each table features details inspired by classic furniture design, such as flared cornices, rounded corners, and cut detailing on the top. 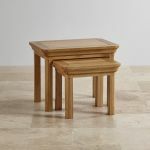 Their size makes them perfect for creating extra space for putting down a magazine or a drink, or even as extra living room seating in a pinch! Shop all our Canterbury living room furniture today.